If your tank is flourishing and you have no algae and both Fish amd Corals are doing well. Do you need to keep on testing your water .If you have an established tank surely by looking at it you would notice if things where not right? I understand the concept of catching things early. But if you are changing water frequently and the salinity is stable surely you are OK? I'd agree , I still test my salinity alk Cal and mag regularly just to ensure I don't need to adjust my doser a little , otherwise I feel my maintenance deals with the rest . I suppose it depends on your methods , the less water changed = more measurements and dosing required I'd presume. I change my water every week without fail. Over the years I have had to overcome every mistake you could possibly make, be it from algae to high salinity to almost cold water. with not only my fish but corals. Somehow my fish survived the corals not so much. In that time have also tried just about every magic potion available and spent £1000s . I am not saying it is the correct thing to do I am merely asking iif its so wrong ? I got a bit lazy with my tank and stopped testing. First I stopped testing salinity and phosphate because they always stayed the same, then gradually stopped bothering with cal, mag nitrate and alk. 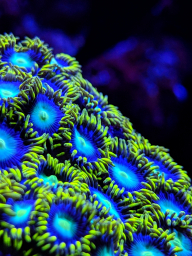 Everything looked okay for a long time (months), then suddenly I got corals stripping at the base. When I did a water test, the salinity was 1.030, the cal over 500 and the alk under 6dkh! Oh, maybe time to start again - most of my test kits are now out of date and my Hanna kits are like the days of the week always changing results that I can’t trust them - the slightest variant maybe where you put your finger or whatever reason it thinks can throw it onto a fit . For example 1.8 Pppm on Hanna LFS 0.01 !! Yeah I'm having a nightmare with this and my salinity measurement at the moment. Bought three different calibration fluids, all totally different readings. Thought maybe the refractometer had gone Pete Tong so I bought a Hanna Salinity checker for £80 which comes with calibration fluid.